We’re knee-deep in snow! Weatherman said all the snow that usually falls throughout the month of December fell between Dec. 3rd and 4th this year. Not to worry ‘cos I bought Bill a new shovel, our snow tires were put on the Ole Probe last week, and I finished teaching the university classes for the year! The event was made all the more special with arrival of relatives and friends from afar. Brother Gene, s-i-l Susan, nephew Martin, niece Janet, husband Larry, children Isabelle and Nathan arrived from Seattle a few days before the wedding. The folks haven’t been in Manitoba for many years, and it was wonderful to see them all. Sister Sue-Sem, niece Ilym, hubby Paul, kids Brendan and Alanna arrived the week before the big day. Although they make this yearly journey to celebrate Grandma Choy’s birthday, we always look forward to their visit and the goodies they haul from Vancouver! Many of the younger folks were booked into Canad Inn and had the opportunity to get to know their cousins better. Ja-On’s had a busy year with his Reactive Orthopedic Massage Therapy business. Not only is he working with his regular clients, he’s also supervising student practicums, and administering final exams at his alma mater – Wellington College in Winnipeg. Angela continues to take courses towards her Bachelor of Nursing, work at Hillcrest Personal Care home, and keep her two boys in line ;-) Soulin is getting to be so grown up! He’s active in soccer and swimming this fall and winter. With Ja and Angela’s hectic schedules, we’ve been enjoying his company at his “big house.” I say “enjoying” with reservations as he’s been quite a formidable opponent in chess, checkers, backgammon, and all other board games! Robin continues his work with DMT at Smart Park in Winnipeg. Still no free Volvo, Jag, or Mitsubishi from the work he does for these companies ;-) His musical talents have been put to good use this year with Dad and Mom - at various gigs such as the Miami (Manitoba, that is) Agricultural Society’s Centennial Celebration dance, and especially at Ja and Angela’s wedding. It was also a band reunion with Kerry Morris and Kevin Pahl – just like old times! That was the first time some of Sue-On’s family saw them perform. The week following Tarzan, we took a short flight over to North Yorkshire, England to visit with old friends Keith and Margaret Jones, and Mick and Margaret Sandbrook and their families. With these folks, we toured many of the venues we performed in back in the late 70s, and revisited favourite locations such as Whitby, Scarborough, Durham, and James Herriot’s surgery in Thirsk. www.HillmanWeb.com/2007 An added treat was a reunion dinner with bandmates – Desperados, now called Raised on Rusks. All too soon, we had to return home to start new teaching terms. Bill is still working as full time professor with the Faculty of Education at Brandon University, and I with the English for Academic Purposes program at BU and evening ESL with WestMan Immigrant Services. In July, Bill was able to fit in a couple of weeks of research work down in Tarzana with Danton Burroughs where they put in long sessions documenting the massive ERB, Inc. archives, meeting with media personnel, visiting film sets and exploring Southern California landmarks such as the Ronald Reagan Library. Following the busy days in California, he flew to the University of Louisville, KY for the annual Burroughs Bibliophile convention and to resume research at the Ekstrom Library. 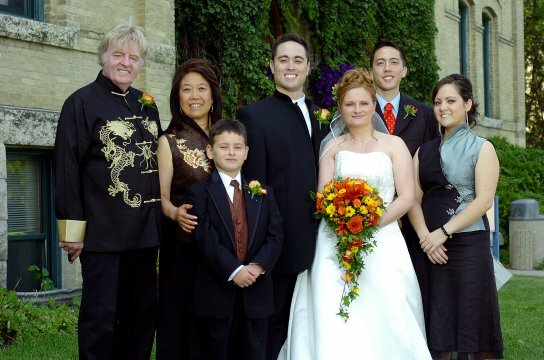 Sue-On was not able to join him for these adventures because of teaching schedules and preparations for the arrival of family and friends for the wedding. Bill continues full throttle as mega webmaster with all the research he does for ERB www.ERBzine.com , for the university www.brandonu.ca/hillman , and for his many other interests: family and local histories, military tributes, writing, music, etc. http://home.westman.wave.ca/~hillmans . It seems his web-universe is never-ending as more and more people world wide seek him out for university research projects and as representative for ERB, Inc., for interviews as an ERB authority, or to share their treasures and writing. Musically, he enjoys jammin’ with his buddies whenever they can get together, performing with a Beatles Tribute band (this New Year’s Eve, he’ll be "John Lennon" at Brandon’s British pub) and of course ongoing gigs with our family band. The kids will all be home for Christmas at Kensington Crescent. Together, we send our love and best wishes to you and yours for a Merry Christmas and Good Health and Happiness in 2008. We’ll look forward to hearing news from you!